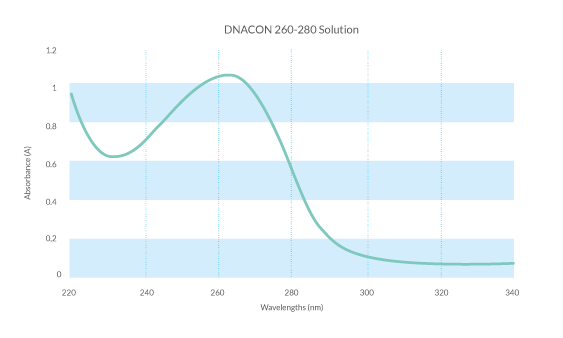 These reference materials have been specially developed for the validation of DNA purity measurements when performed with the dedicated low volume (< 5 ul) and short path length (< 1 mm) instrumentation offered by several vendors for use in genomics and proteomics, when sample is often at a premium. They are also ideal for qualifying conventional instruments when they are used with ultra- low volume cells such as the Starna DMV-Bio cell. The references are supplied in vials with screw-cap closure for ease of handling, and from which it is easy to transfer them to the instrument under test using a micropipette or syringe. Each vial contains 1.5 ml of DNACON solution. 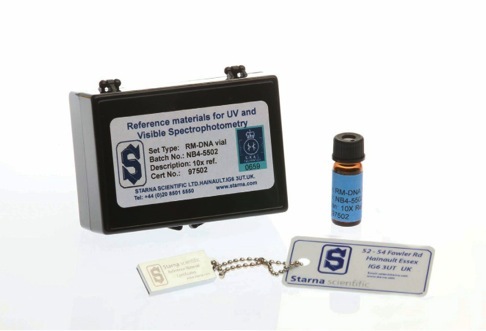 The DNACON reference from Starna was developed as a reliable, stable and NIST traceable reference material for the validation of this method. The reference consists of a solution of a synthetic material whose spectral characteristics closely mimic those of pure DNA, but does not suffer from the instability and other difficulties associated with DNA itself. Two concentrations are available in vial format, to give absorbances of approximately 1 A or 0.5 A at a nominal path length of 1mm.